Thousands of homeless New Yorkers struggle to survive on the streets every night. As winter approaches, high winds, frigid temperatures, snow, and freezing rain can put them at risk of life-threatening illnesses like hypothermia and frostbite. The City declares a Code Blue warning when the temperature drops to 32 degrees or below, including wind-chill, between 4:00pm and 8:00am. 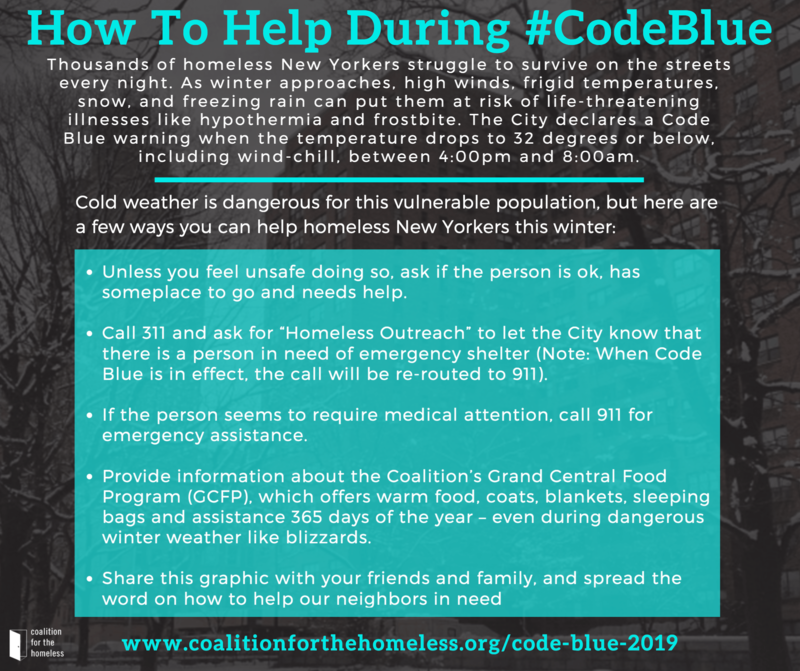 It is important to note that homeless individuals and families always have a right to shelter in New York City regardless of the weather, but there are expanded outreach and drop-in services as well as different shelter and intake rules when Code Blue is in effect. Call 311 and ask for “Homeless Outreach” to let the City know that there is a person in need of emergency shelter (Note: When Code Blue is in effect, the call will be re-routed to 911). Provide information about the Coalition’s Grand Central Food Program (GCFP), which offers warm food, coats, blankets, sleeping bags, and assistance 365 days of the year – even during dangerous winter weather like blizzards. Click here for a list of stops. The post How to Help Homeless New Yorkers During Cold Weather appeared first on Coalition For The Homeless.